Experience this spectacular two hour cruise witnessing one of Australia’s largest wild Fur Seal Island colonies situated on Seal Rocks 2kms off the rugged south west coast of Phillip Island. Experience this spectacular two-hour cruise witnessing one of Australia’s largest wild fur seal colonies situated on Seal Rocks, 2kms off the rugged south west coast of Phillip Island. This amazing eco-cruise takes you along the scenic coast of Phillip Island to Seal Rocks, where your skilful captain will manoeuvre the boat amongst the rocks where thousands of fur seals play! You are in for a truly amazing wildlife and educational experience which includes commentary, afternoon tea and children’s activities on the way home. 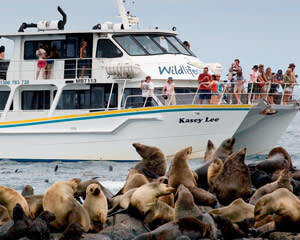 The boat drifts within metres of thousands of seals, enabling you to witness their natural environment first hand. It is impossible not to be captivated by these naturally playful and inquisitive animals who regularly approach the boat for a closer look at you! As the cruise takes you into the open waters of Bass Strait and can be rough at times those passengers suffering from motion sickness are advised to take the necessary precautions. 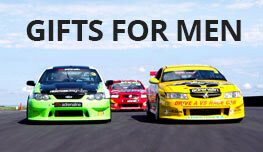 Usually departs 2:00 PM and/or 4:30 PM depending on demand and the weather on the day. 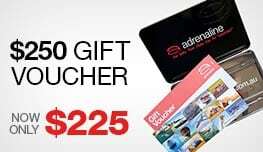 I received an adrenalin gift voucher for my 30th birthday. It was an absolutely fantastic gift! Easy to use and an awesome day out! This trip was amazing. The seals were swelling in the sea and swarming around the cruiser. Ive never seen anything like it. The weather was perfect and we saw many penguins swimming on our return to Phillip Island. One of our party had just returned from the amazing wildlife of the Galapagos and Antartica and was still totally amazed by the fantastic wildlife on our doorstep here in Melbourne. Thank you Adrenalin! !